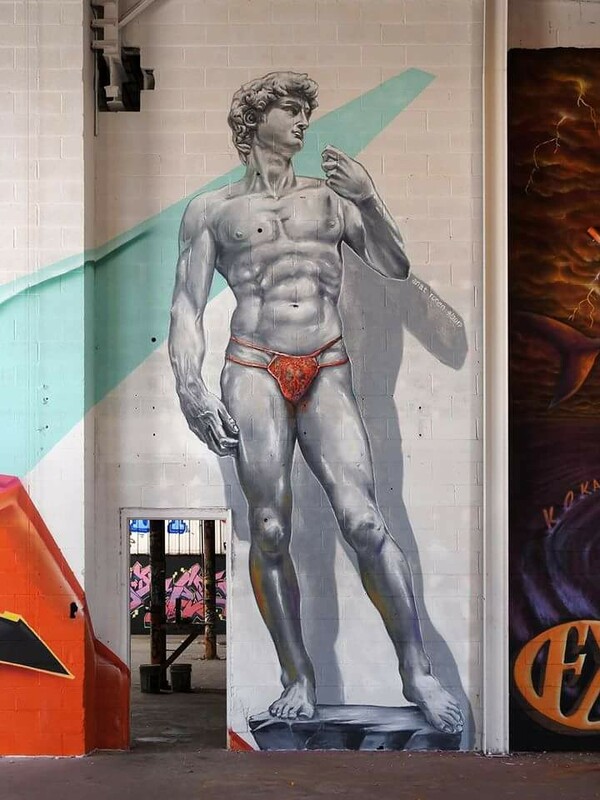 Dec. 10, 2018 – The City of Austin has contracted with UP Art Studio to bring its successful Mini Murals program to Austin. 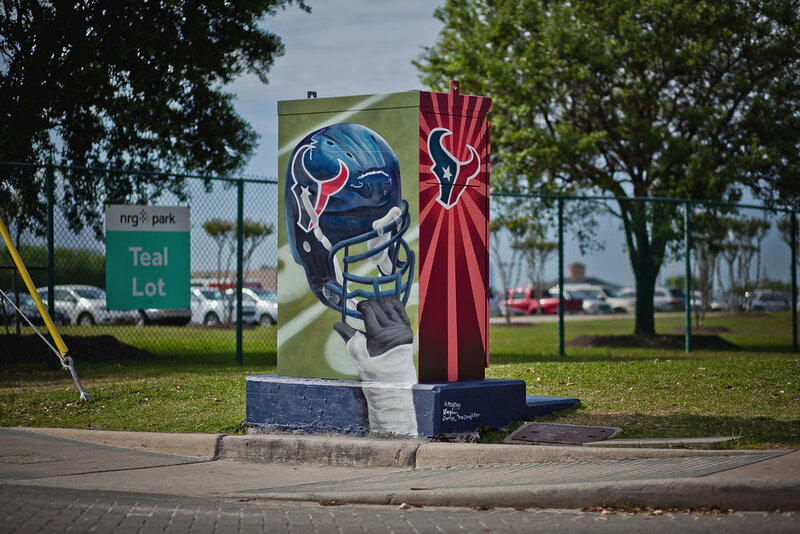 Austin Transportation Department has started an Artbox Program, making traffic signal control cabinets at intersections available as canvases for artists. 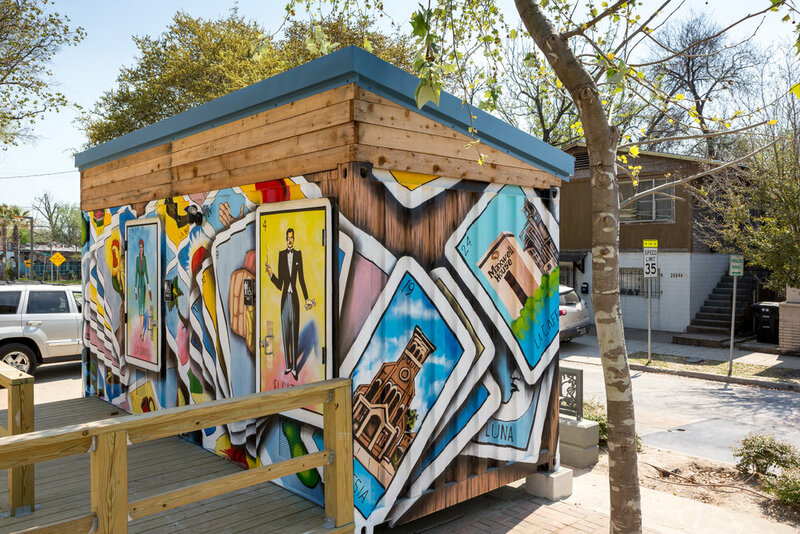 Starting today, UP Art Studio has opened a Call for Artists, inviting local Austin artists to submit their qualifications for the opportunity to create an artbox (mini mural) on a signal cabinet. The deadline is Sunday, Dec. 30, 2018. Artist applications will be reviewed, and qualifying artists accepted, to create a registry of artists available for this opportunity and future projects managed by UP Art Studio. The first four installations are being funded by Austin Transportation Department. “The Artbox Program is just one way we are moving to make Austin streets more people-oriented -- better, more lively places for people to walk and bike and express the special character of our community,” said Katherine Gregor, who has started up the new program at Austin Transportation. “We are excited that the City of Austin is advancing this program,” said Noah Quiles, Managing Partner of UP Art Studio. “We’re also seeking other sponsors for more installations in Austin. In Houston, we have completed over 200 installations. Our sponsors see a mini mural as a great way to give back to the community. 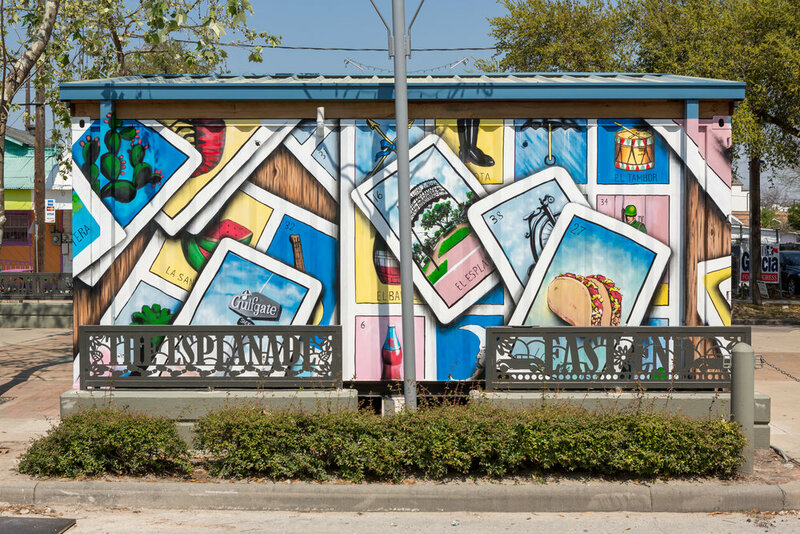 The cost to sponsor a mini mural is $2,500, with $1,000 going directly to the artist.” Additional opportunities for artists to enhance Austin cabinets are expected, as more project sponsors are identified. Artists interested in joining the registry can find the Open Call guidelines at www.minimurals.org/austin. The application requires providing qualifications, images of prior work, a letter of intent, and other information. Applicants will be notified of results the week of Jan. 14, 2018. For more information about the project, visit www.minimurals.org. March 15, 2018 — (HOUSTON) Following the recent success of the “Turtle Soup” mural, UP Art Studiohas teamed up with the Greater East End Management District (GEEMD) to create more murals that depict icons of the East End. Completed this week, is the “East End Loteria” mural, which is a play on the popular Mexican game of chance. Along with some of the traditional icons of the game, the artist, Gelson Lemus AKA “w3r3on3”, envisioned the game using icons of the East End, such as Our Lady of Guadalupe church, and the esplanade itself. 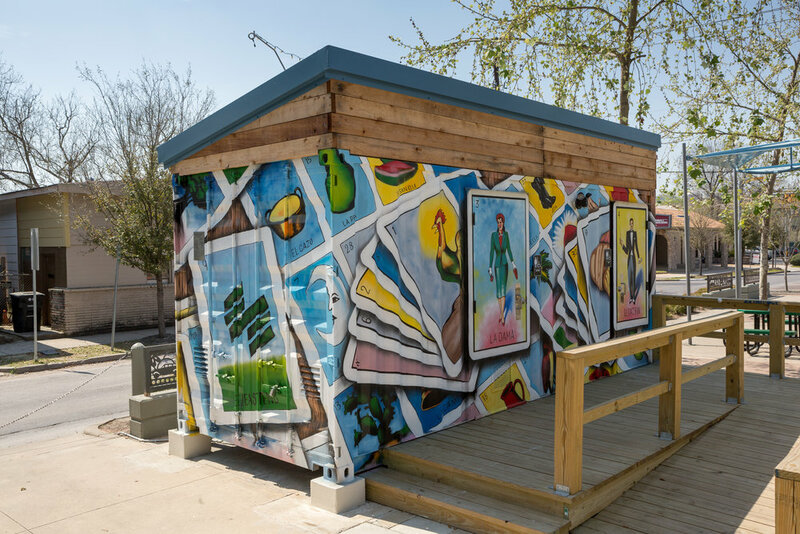 Located on the Navigation esplanade, the container houses new public restrooms. 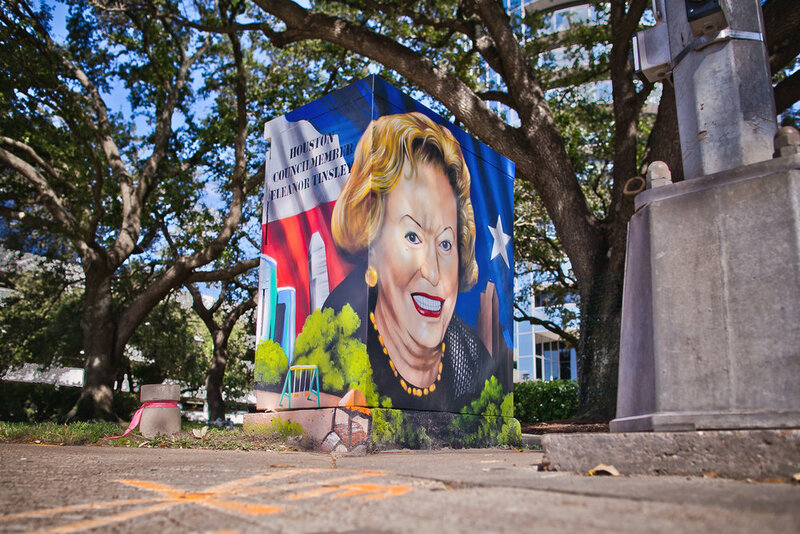 Heroes & Icons is a series of murals curated by UP Art Studio throughout Houston. 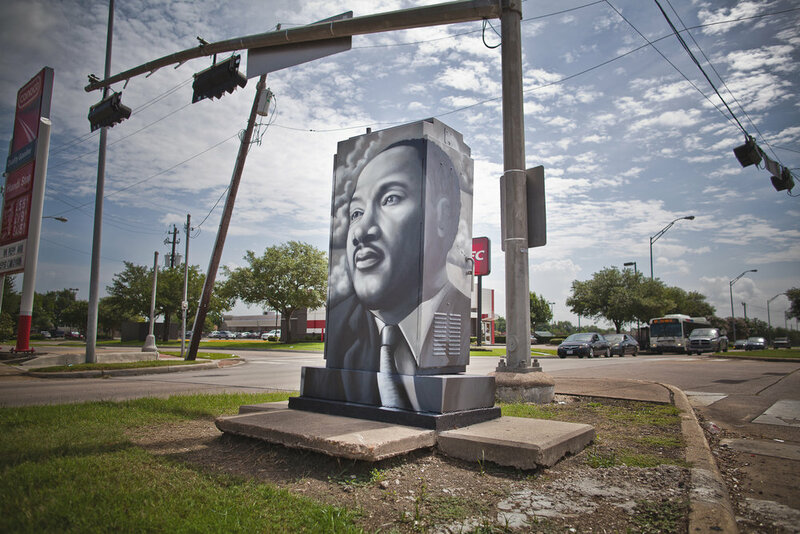 Examples include a tribute to Don Robley’s Peacock Records in the Fifth Ward painted by street artist Wiley and a multitude of Mini Murals including but not limited to, Dr. Red Duke, Martin Luther King Jr,, President Obama, Earl Campbell, Barbara Jordan, Ann Richards, Eleanor Tinsley, Sgt Macario Garcia, John P. Mason, Cesar Chavez, Frida, Willie Nelson, and Howard Hughes. Also recently completed by artist w3r3on3 x UP Art Studio is a mural at the drive-through of the Space City Federal Credit Union depicting the iconic Mexican “Papel Picado” pattern, and showcasing the East End logo, which has been popping up in artwork and signs across the district. Other mural projects managed recently by UP Art Studio in the East End include “Turtle Soup” and two Magnolia Park commissioned murals at the former WYCA on Navigation Blvd, which is breathing new life. 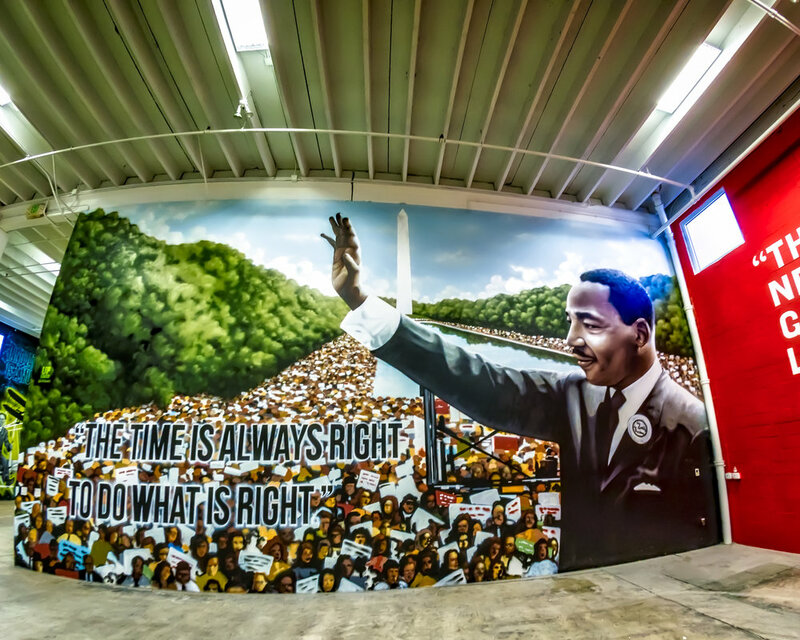 The murals at the WYCA, which were painting by Jay Mack "Muzik" showcase the magnolia flower – one mural located in the interior grand gallery of the building, and one mural located on the highly visible exterior wall of the building, owned by art collector David Duthu. Turtle Soup is a mural that was painted via the partnership with the GEEMD, which spent two weekends in June working with more than 300 veteran and student volunteers to clean up an abandoned railroad spur, which was converted into a walking trail. 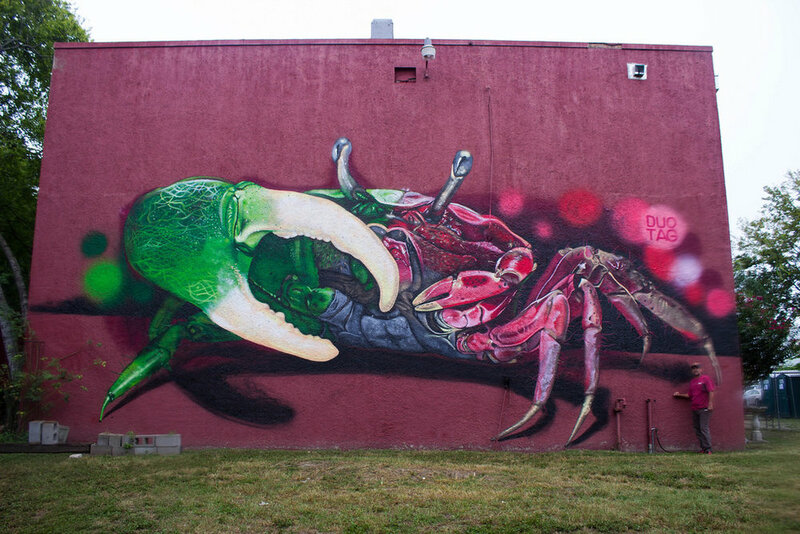 The District also cleaned and primed a 260-foot concrete wall on JW Peavy in preparation for “Turtle Soup” which was painted by Adam Socie AKA “Pilot”, visiting artists Koka and MrPrvrt from the Meeting of Styles festival. 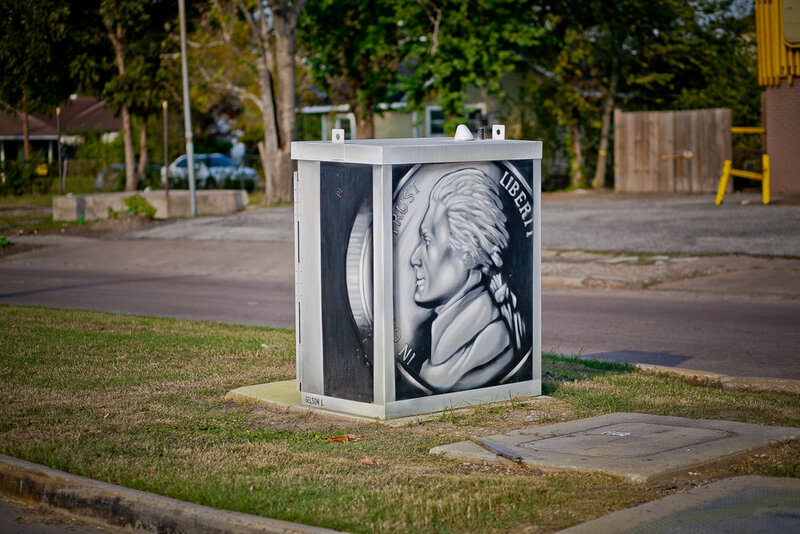 The beautification efforts led to a Keep Houston Beautiful Mayor’s Proud Partner Award. Other sponsors of the mural included: Shell, NuStar Energy, Sesco Cement, Port of Houston, and Council Member Gallegos. 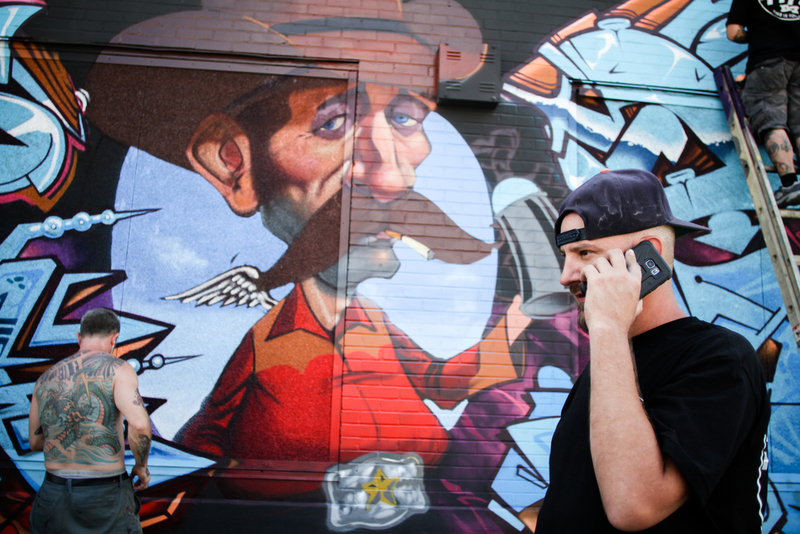 UP Art Studio’s work in the East End began with the Mini Murals project. More than 15 Mini Murals have been painted throughout the district, via a partnership with the GEEMD graffiti abatement team. 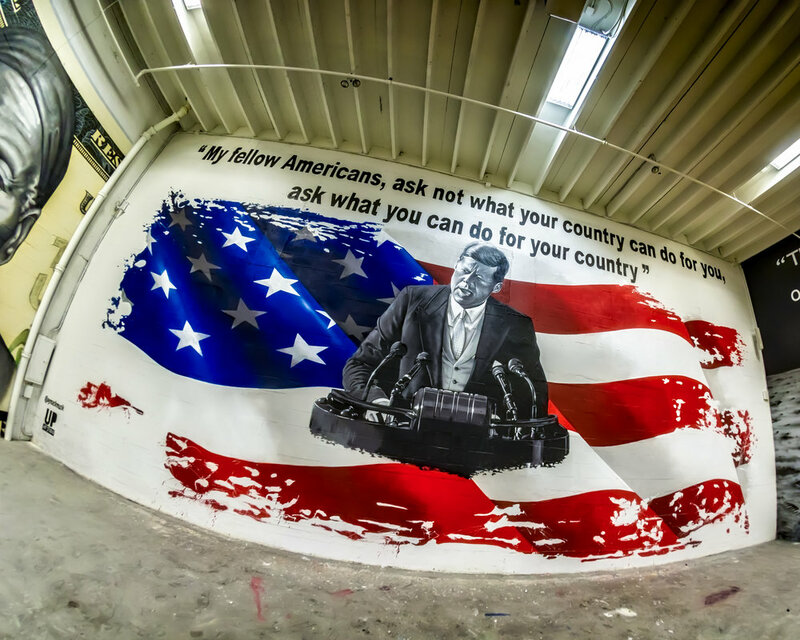 The studio has also worked with artists at the Harrisburg Arts Museum (HAM) on special murals such as the one of Cheech Marin, which was painted by Carlos Alcaraz AKA “Empire” to commemorate the actor/art collector’s role as the grand marshal of the Art Car Parade in 2017. 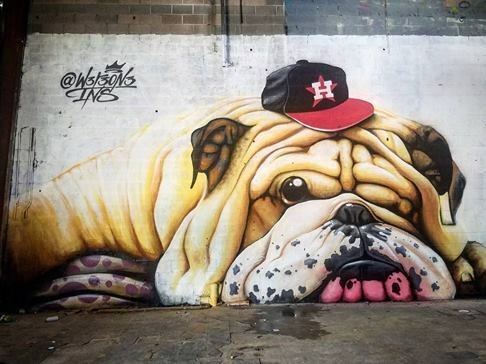 UP Art Studio also co-produced the Meeting of Styles graffiti festival with Adam Socie AKA “Pilot” at multiple locations throughout the East End in 2015 through 2017. The Heroes & Icons Series has also been implemented in Miami, via a commission by former Mayor of Miami Beach, Philip Levine, who is running for governor of Florida. Themes for this political series include: JFK, Rosie the Riveter, Dwight Eisenhower and the Greatest Generation, MLK, Cesar Chavez, Harriet Tubman, the Moon Landing, a tribute to Innovation featuring The Wright Brother, Nikola Tesla, and Steve Jobs, and a masterful anamorphic art piece of the Lincoln Memorial by Houston artist w3r3on3. Mr. Levine evoked each mural in his announcement speech for his run for governor of Florida. 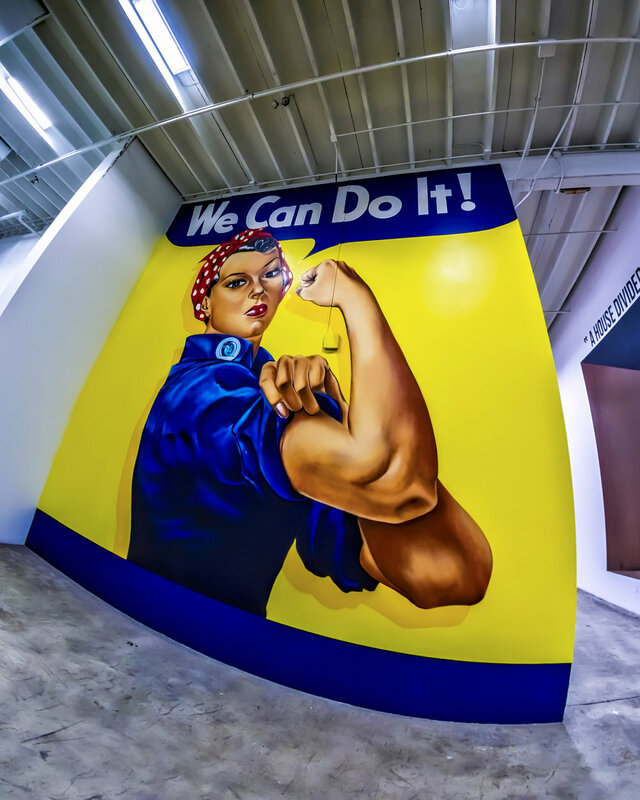 "Big Walls, Big Dreams" is a collection of walls in Wynwood, curated by UP Art Studio, and painted by 15 artists from around the world during Art Week Miami 2015. Artists include Shalak and Bruno Smoky from Toronto/South America, Enrique "Sero" Cruz and Ray Jafete from Miami, Inkie, Mr. Cenz, Lovepushr from England, Jay Mack "Muzik" from New Jersey, El Pez, Zosen and Mina Hamada from Barcelona, FPLO and Graphis from Brazil, Eelco Virus and Mr. June from The Netherlands, Brusk DMV from Paris, Dread from Denver, Colorado, Mas Paz and Che Love from Washington, DC, and Nicky Davis and Wiley Robertson from Houston, Texas. UP Art Studio and artist Shelbi Nicole hosted a closing event for the District K Pilot Phase of the Mini Murals Project, titled Mini Murals: Beyond the Box, which featured an art show for the artists that participated in the Mini Murals pilot phase, with 100% of proceeds from the sale of artwork going directly to the artists. The Beyond the Box event simultaneously kicked-off the open call for artists through the Houston Arts Alliance, in addition to the capital fundraising campaign to ensure the vitality of the project for many years to come. 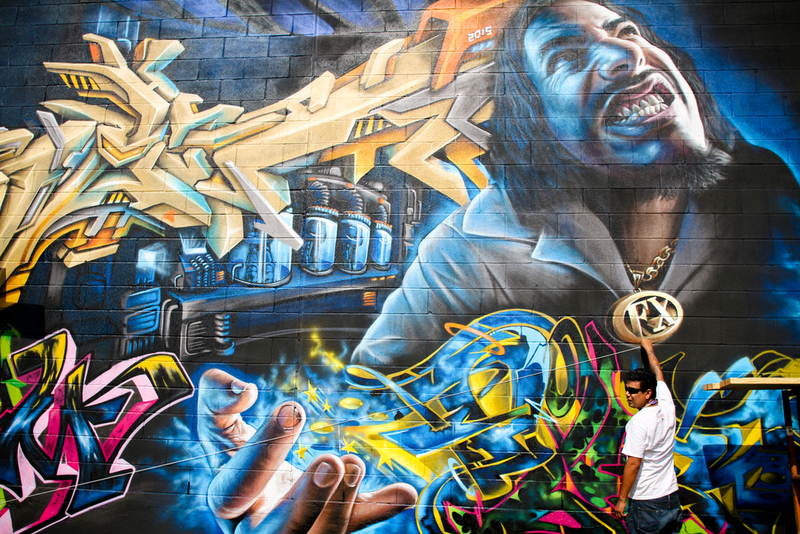 Meet Jay Mack, The Graffiti Artist Who Creates Masterpieces All Over Rick Ross’ Home!